One of the biggest challenges when learning to speak Arabic is finding good Arabic textbooks and reference materials. Many students feel frustrated because there just aren’t any Spoken Arabic Dictionaries with the essential Arabic vocabulary for daily life. It’s easy if you want to study Modern Standard Arabic, but trying to learn the vocabulary and expressions used by real Arabic speakers is almost impossible. Well, not anymore. I decided to create an Arabic dictionary including the most useful words and phrases, suitable for all levels, from Beginner through Intermediate to Advanced. I only chose useful, current Arabic vocabulary, widely used today. I have collected all the Arabic phrases used in every imaginable situation and put them in one place. 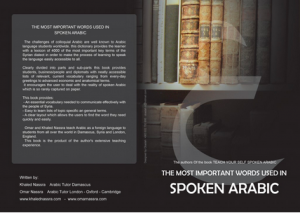 This Arabic dictionary is a must-have for all students who want to perfect their Spoken Arabic. You won’t find this many useful expressions and vocabulary items anywhere else. Clearly divided into sections, this book provides easily accessible lists of relevant vocabulary. You will find useful Arabic expressions and idioms as well as specific economic and political terms.